Two full days, three short nights, and over thirty hours of travel time. 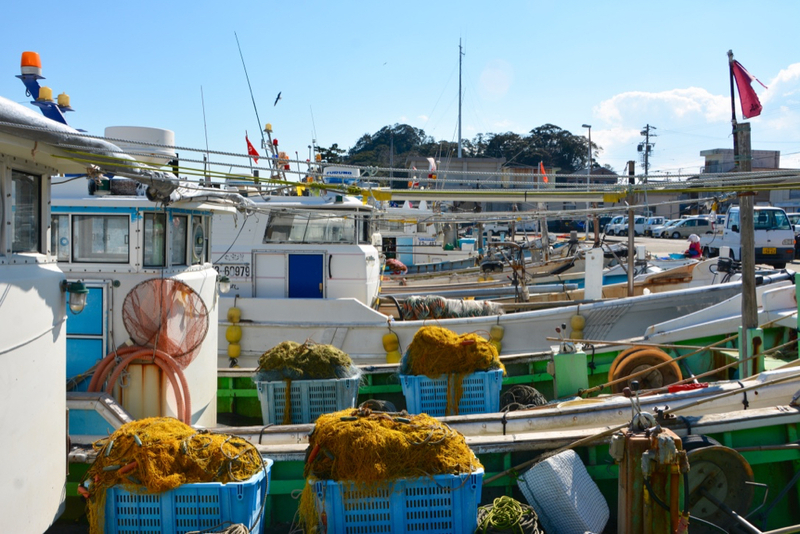 On paper, my February trip from Paris to the Mie Prefecture in Japan made absolutely no sense. This type of trip is difficult, both mentally and physically, but the temptation to return to Japan was too much to resist, especially given my company. Chef Cyril Lignac, with his Michelin star and impossibly perfect Parisian patisseries was the cornerstone of this trip to Japan. 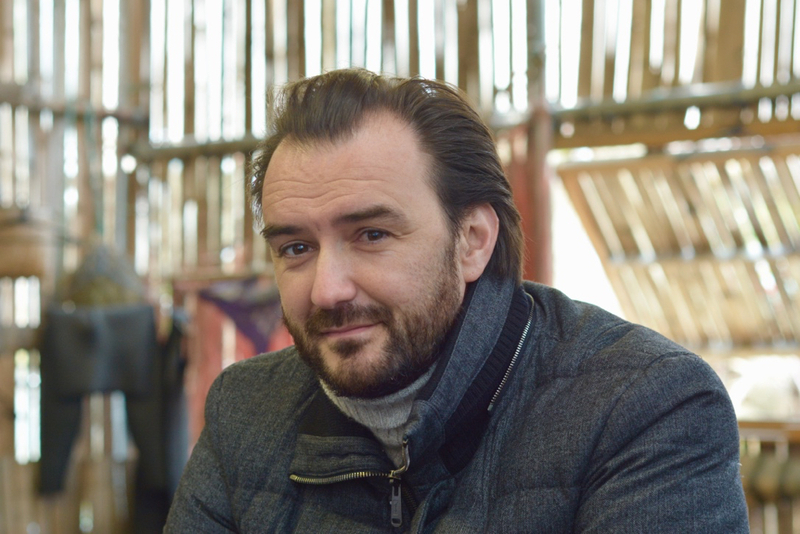 Also a TV celebrity in France, chef Lignac is known for his charismatic personality and brooding good looks. Since I had previous obligations in Paris, this trip would have to be abbreviated. 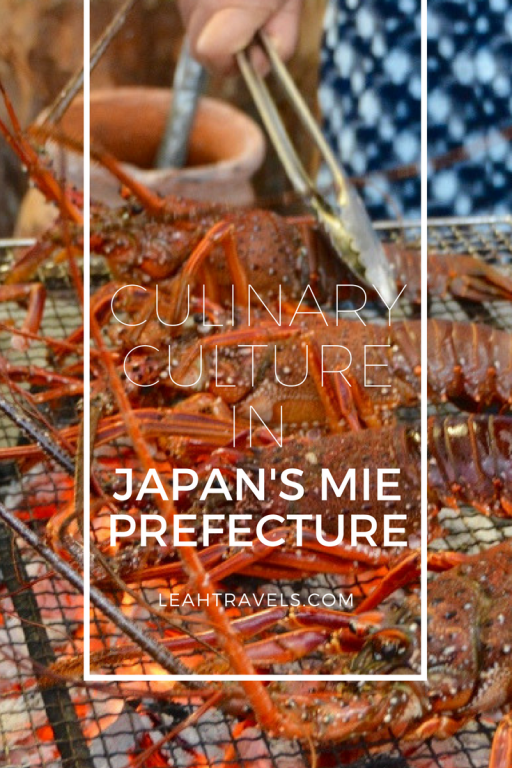 And despite the shortened itinerary, I agreed to the whirlwind foodie tour of Mie with chef Lignac, as well as a camera crew, translators, and entourage of Japanese ambassadors. I flew into Nagoya, an airport in the Aichi Prefecture, where I spent a few short hours sleeping in a nondescript hotel. Morning brought a breakfast buffet filled with fish dishes, lots of coffee, and a car that would take me to the Mie Prefecture, home to May’s G7 Summit. In a few months’ time, leaders from the world’s most powerful countries, along with international media, would descend on this area southwest of Tokyo. My mission was not a political one, but rather a culinary one. 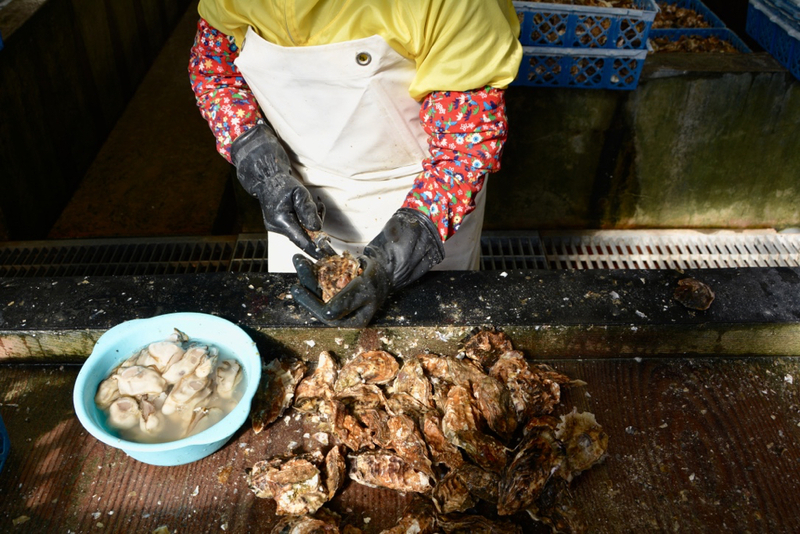 The first stop on this culinary journey was to Sato Oyster Farm in Matoya Bay, an inlet on the Shima Peninsula. 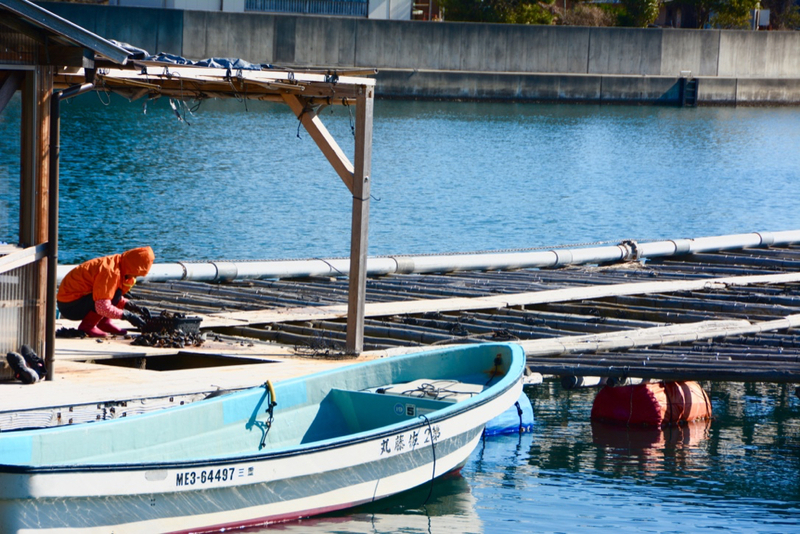 Three rivers originating from the mountains of Shima converge here, making this a prime location for oysters. Dating to 1925, the farm provides oysters to some of Tokyo and Japan’s finest restaurants. These plump, saltwater clams are prized in the country, and the price reflects that fact. In six months, the farm produced over a million oysters. 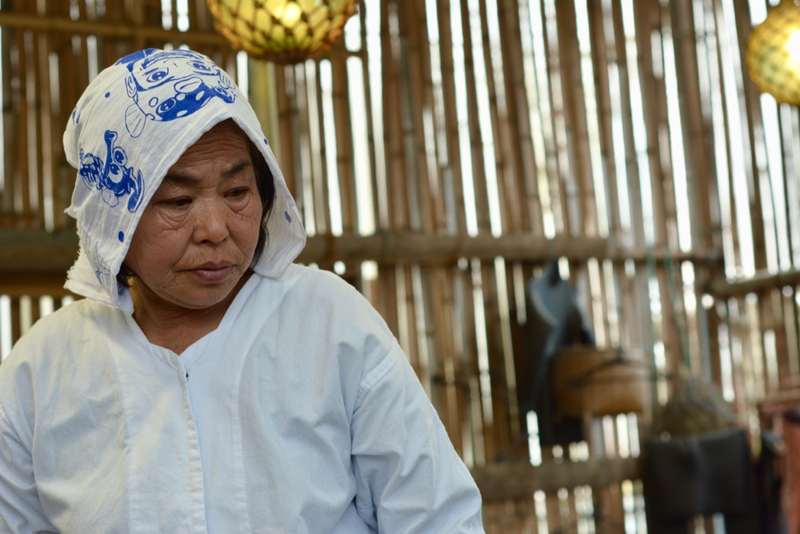 The ladies who work at Sato shuck about 1,000 oysters per day, working six days per week from 8:00 am to 4:30 pm. Handed a freshly shucked oyster, I ate the meat straight from its shell and then slurped the salty brine. No lemon. No Tabasco. Just the taste of the sea, which surprisingly hit the spot for a mid-morning snack. 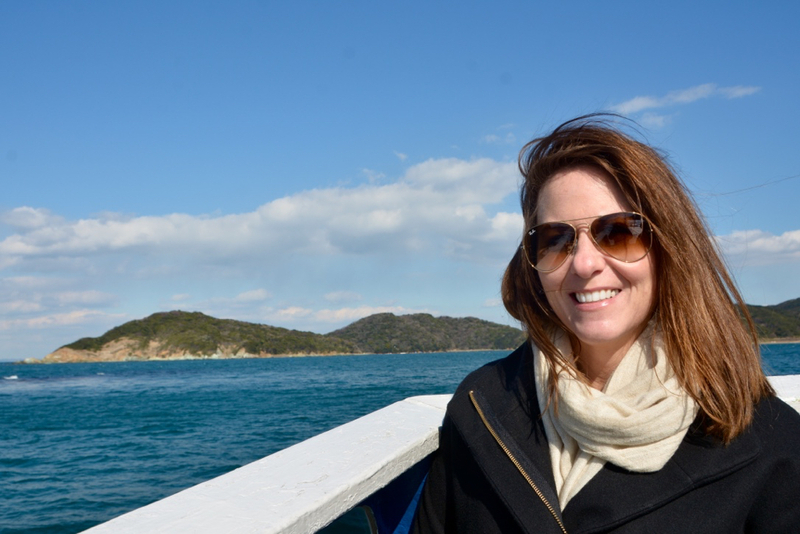 With luggage in tow, we boarded a boat to Tōshijima, an island in Ise Bay. 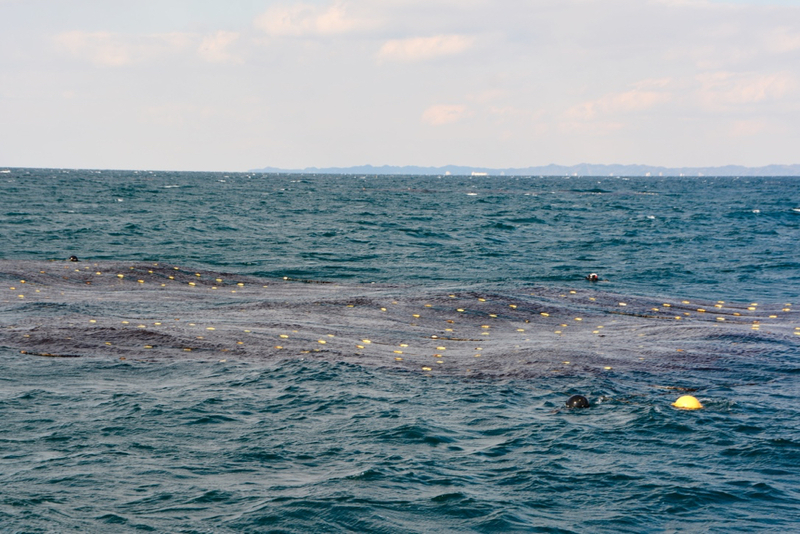 With a population of about 2,000 people, Tōshijima survives from commercial fishing. 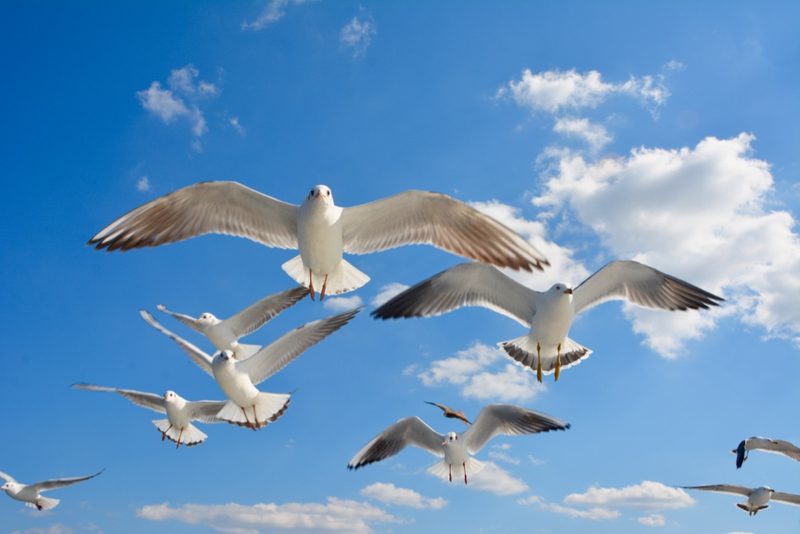 On the thirty-minute journey, we were led, or perhaps followed by a flock of seagulls and eagles. 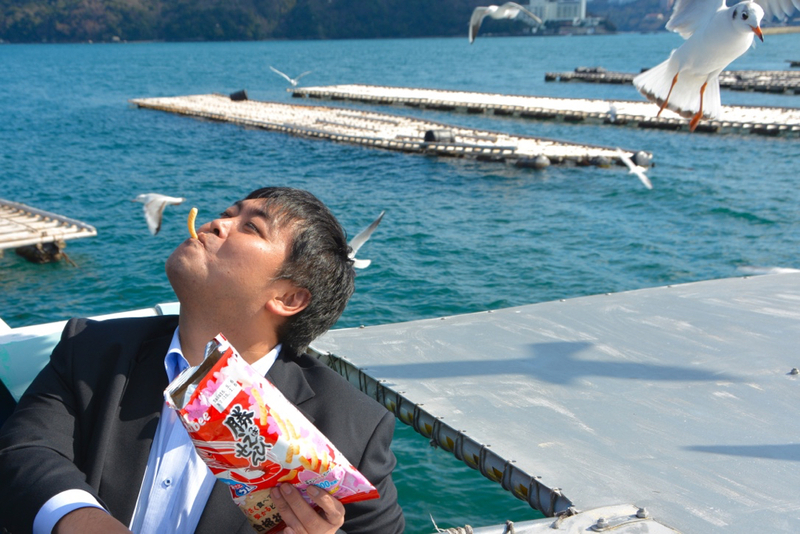 They’ve learned that a boat likely means food, but we only had shrimp-flavored chips. Though, they weren’t picky, devouring each piece flung their way. The sun was shining, but the bone-chilling wind whipped through my modest coat and scarf. The occasional splash of ocean water caused me to shiver even more. During the ride, I refused to step inside to the warmth, rather choosing to devour the surprisingly stunning coast. From the distance, I spotted a seaweed farm. Only marked by yellow buoys and a slight blackness in the otherwise cerulean water, the floating farm looked like a massive amoeba. 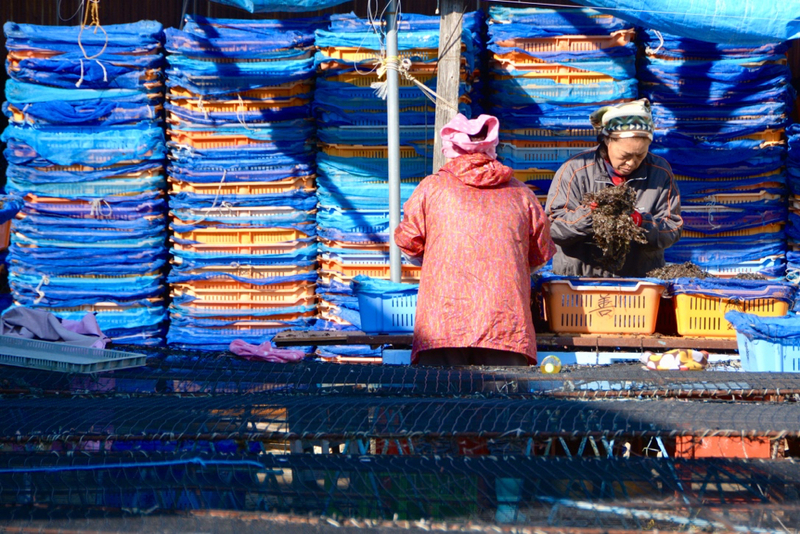 Upon docking, we were greeted with typical Japanese hospitality and bags full of crisp nori. I took a sheet and slipped it onto my tongue, allowing the salty, simple flavors to mingle in my mouth. We were at a nori factory, and this was the fruit of their labor. This toasted, paper-like seaweed is found in most kinds of sushi and is one of the most important ingredients in Japanese cuisine. Nori, after all, is what holds sushi together. 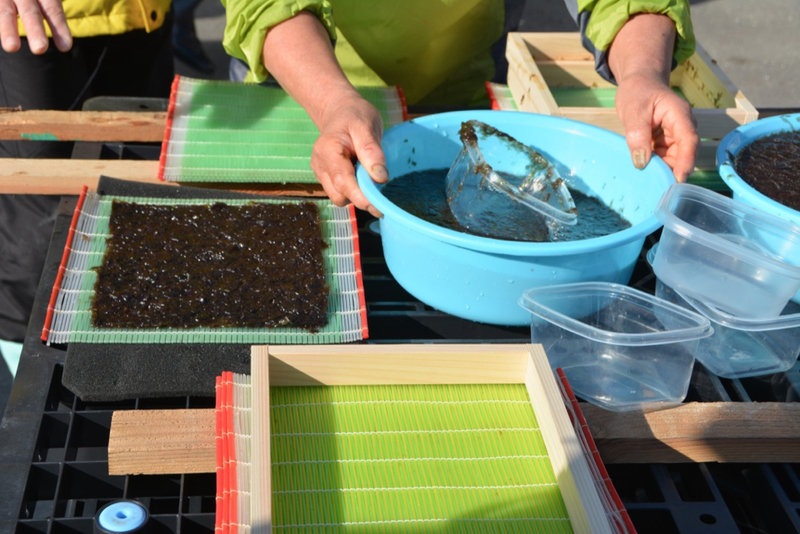 Once a painstakingly, lengthy process, nori was made by hand and dried on racks in the sun. 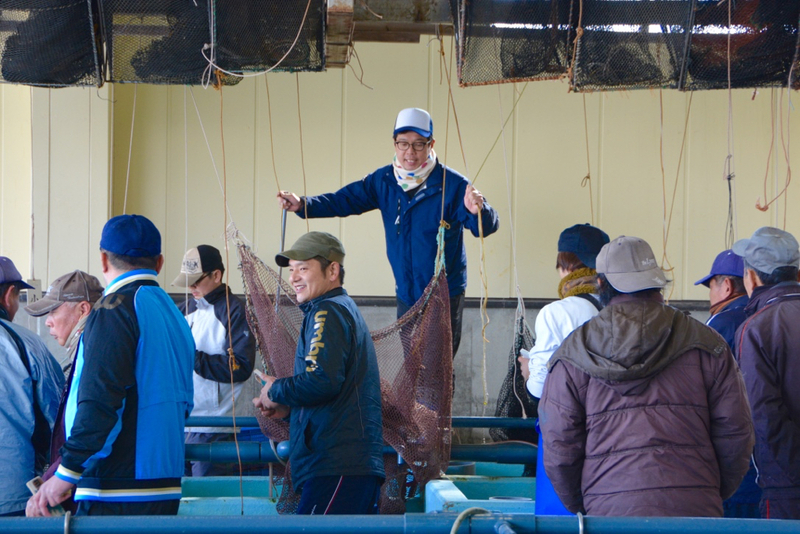 Before entering the factory, we were shown the original nori-making method. Huge vats of seaweed whirled with the help of modern technology. 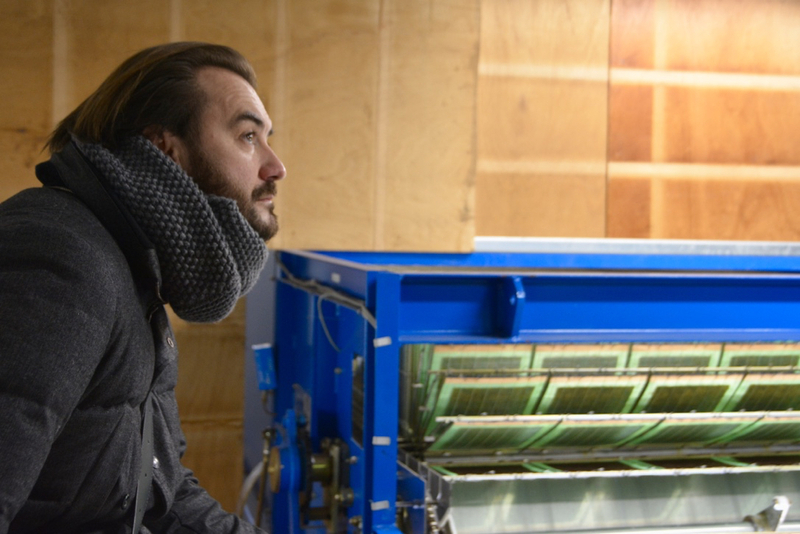 I wandered through the factory, but with the humming of machinery and my lack of Japanese and French language skills, it was up to me to decipher the process. 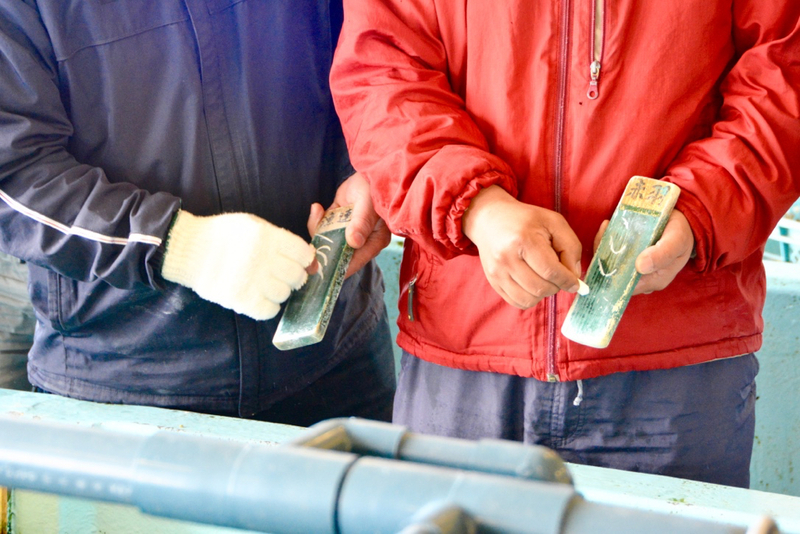 Before leaving the nori plant, we were led outside and introduced to arame-maki. 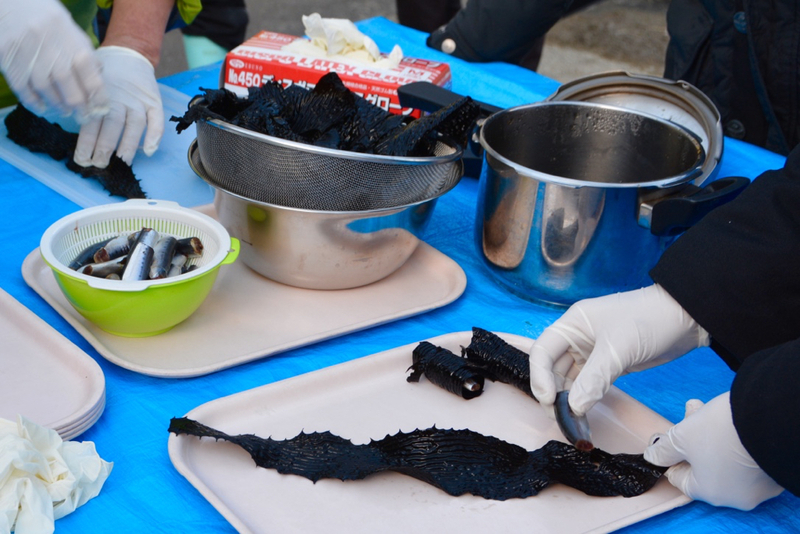 A traditional dish of Tōshijima Island, arame-maki is made from freshly caught sardines and arame seaweed. The fish heads are removed and rolled with the seaweed, then simmered in soy sauce, sake, and sugar. This local delicacy would be part of our dinner later that night. Arriving at Ryokan Yamashichi, which is a traditional Japanese hotel, was an experience in and of itself. Shoes were left at the door and replaced with rubber slippers. My room featured no bed, but did have one of the best Pacific Ocean views I’ve seen. A thin futon and a couple of pillows would serve as my bed, and I was lucky to have a private bathtub, rather than relying on the communal bath down the hall. In the dining room of the ryokan, two long tables were set for a dinner feast. What I’ve learned about Japan is that variety is the spice of life. Oysters one way are not sufficient. Rather, no less than four ways is acceptable. Hot and cold sake was offered, along with beer, for the meal. I didn’t know much of the food that sat in front of me, but I tried it all with a bit of trepidation. As soon as I finished one plate, another replaced it. Bewildered at times, I looked to the Japanese around me for clues as to how to eat some of the dishes. Exhausted and extremely satisfied, I rolled onto my futon for a few hours of sleep. I had a full day exploring Tōshijima Island ahead. Mr. Motoya Yamashita greeted us with the morning sun. Although we were barely awake, he’d been up for hours fishing. 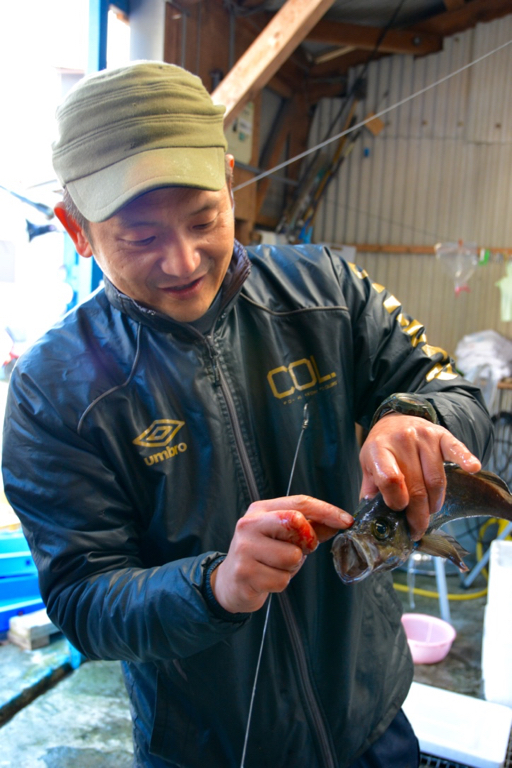 Tough to stomach, especially at 9:00 am, Motoya showed us two ways of killing fish: the fast way and the slow way. 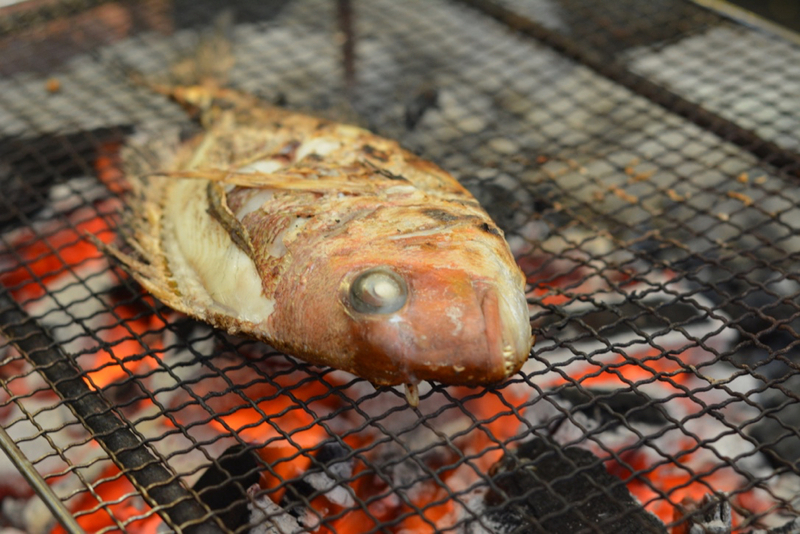 He explained that the method of death impacts the flavor of the fish’s flesh. Then with his razor-sharp knife, he carved a redfish for sashimi that would later appear on our lunch table. Nothing goes to waste here, a concept that I appreciate. The last of the fishing boats had come in. With nets full, a husband and wife carried their catch-of-the-day to be weighed. A familiar face walks in: Motoya Yamashita, the sashimi master from the morning. It was before noon, and buyers from around Japan were gathering for the daily auction. Like runners preparing for the 400 meters, the buyers gathered around the auctioneer with chalk and small chalkboards in hand. From container to container, the group rotated as they scribbled and erased their bids. The process moved with precision, though to a first-time observer, it felt hectic. Ama divers are a 3,000 year-old tradition in Japan. In fact, UNESCO now recognizes them as an Intangible Cultural Heritage. These women, whose average age is 65, dive at depths of 5-10 meters using only masks. 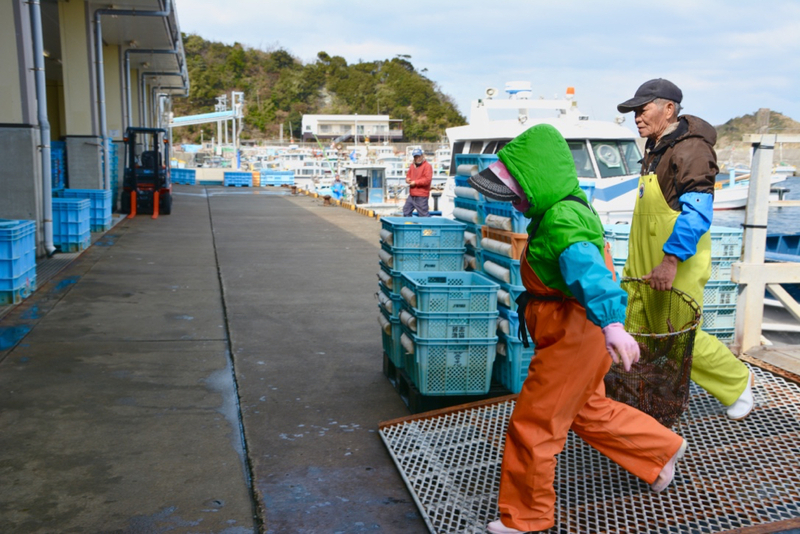 With the help of their husbands who manage the boat, Ama divers fish for sea urchins, seaweed, and abalone twice per day. With only about 700 Ama divers left in the Mie Prefecture, the tradition seems to be fading, despite the best efforts to recruit younger women. 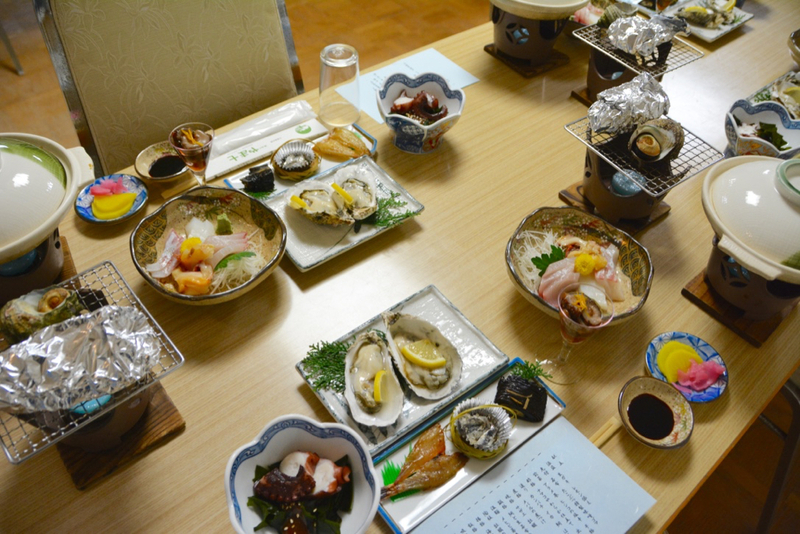 It was in the Ama divers’ hut that I was invited for lunch. This modest wooden building sits footsteps from the boat docks, and is a place for the women to warm up, visit, nap, and eat after diving. It’s an a privilege to not only be invited inside, but to sit around their fire for a meal. 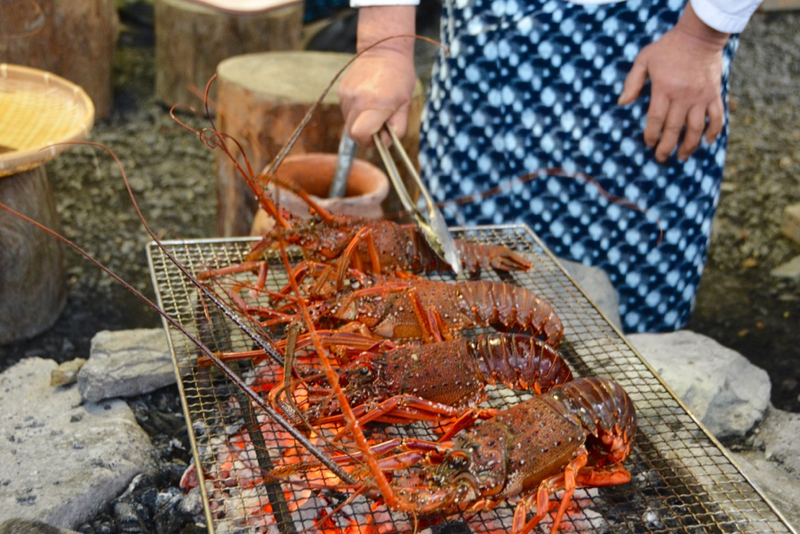 Giant lobster, oysters, and a variety of fish were plucked from the sea and put onto the open-fire grill. Live crustaceans sizzled over the red embers and plates were passed. It was truly family style, and I was honored to be a member on this day. After lunch, we boarded another boat bound for Kashiko Island. 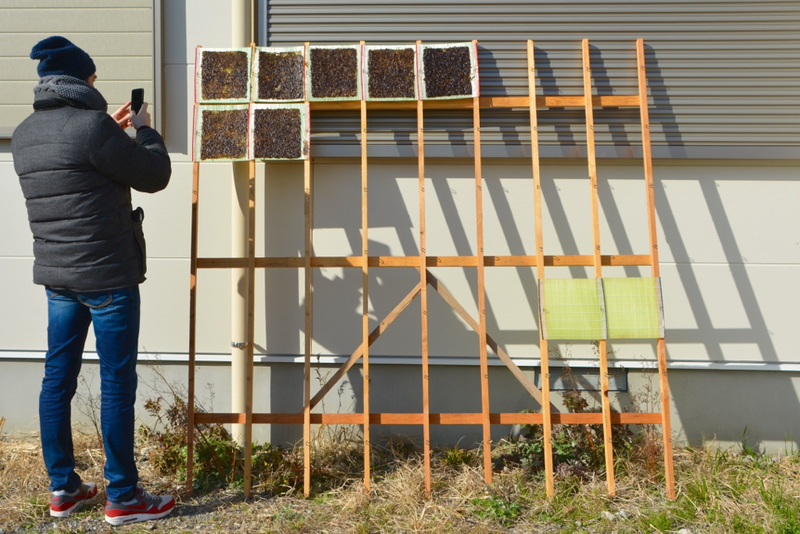 Here, we would visit a bonito hut and learn about katsuobushi. 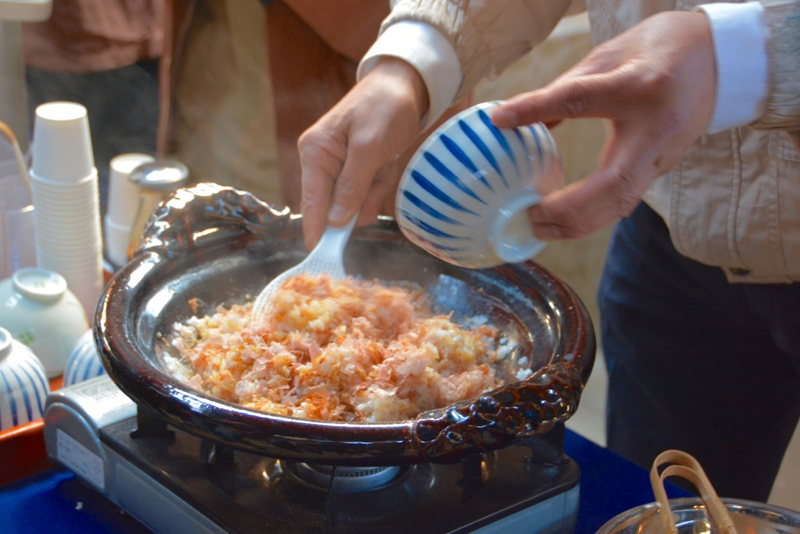 As one of the staples of Japanese cooking, katsuobushi is skipjack tuna that ‘s been dried, fermented, and smoked. 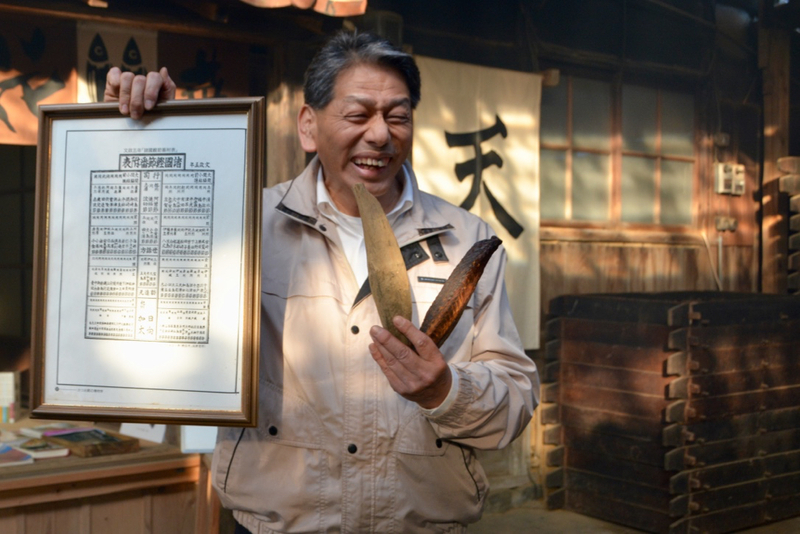 This is where I met Tenpaku Yukiaki, possibly the happiest and most proud producer of katsubushi in Japan. 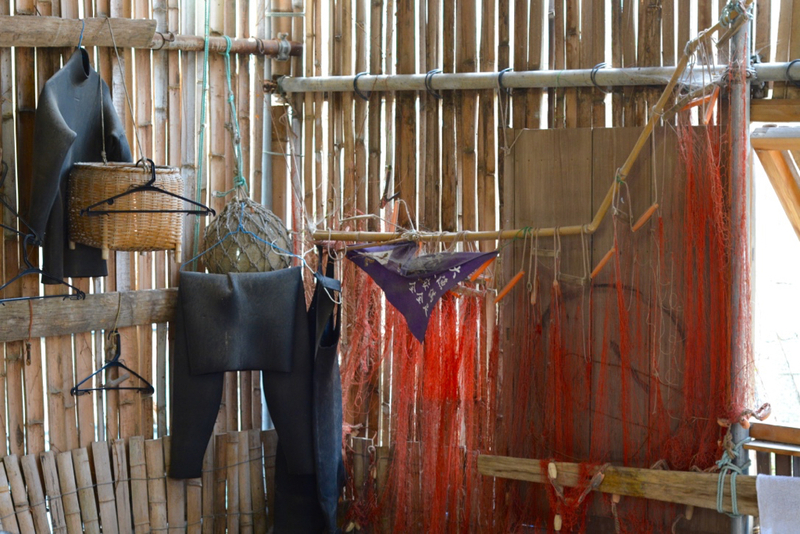 Made for centuries, this fish rotates between a humid fermentation room and drying room, sometimes up to six months. The result is akin to a piece of wood. Shaved, it’s used in countless Japanese dishes, including hokaka gohan, which is a traditional breakfast food that includes rice, soy sauce, with katsuobushi flakes mixed. At the end of May, the 42nd G7 Summit will take place at the Shima Kanko Hotel, which is where my last dinner in Japan also took place. 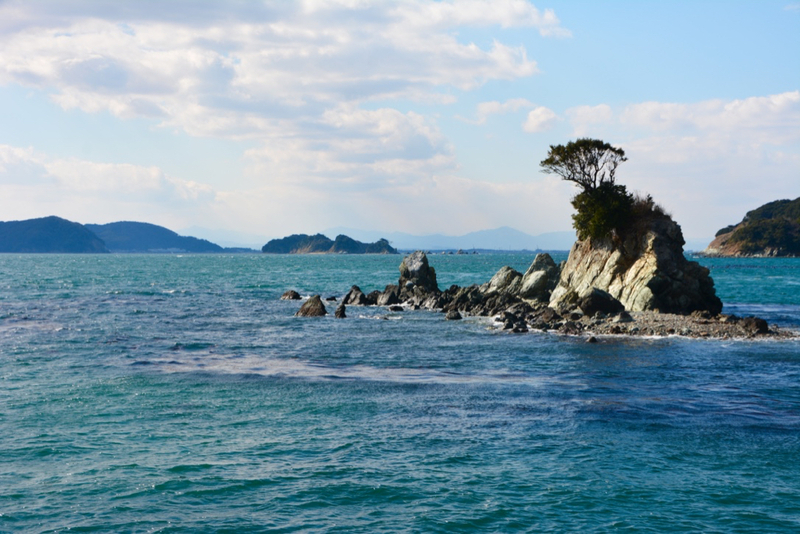 Located on Kashiko Island in Ise-Shima, this luxurious hotel overlooks the picturesque Ago Bay. With the sun setting, we sat down to a tablescape befitting world leaders. In fact, the French seafood restaurant, Le Mer, will play host to those leaders, where they will dine on the very menu I was served. French wine flowed as course after course was served. 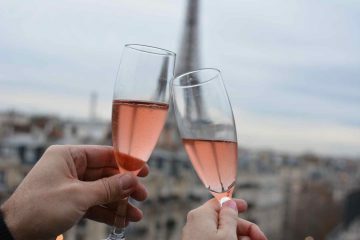 There are no two nations where the art of dining is more revered than France and Japan, a fact reflected in their number of Michelin-starred restaurants. 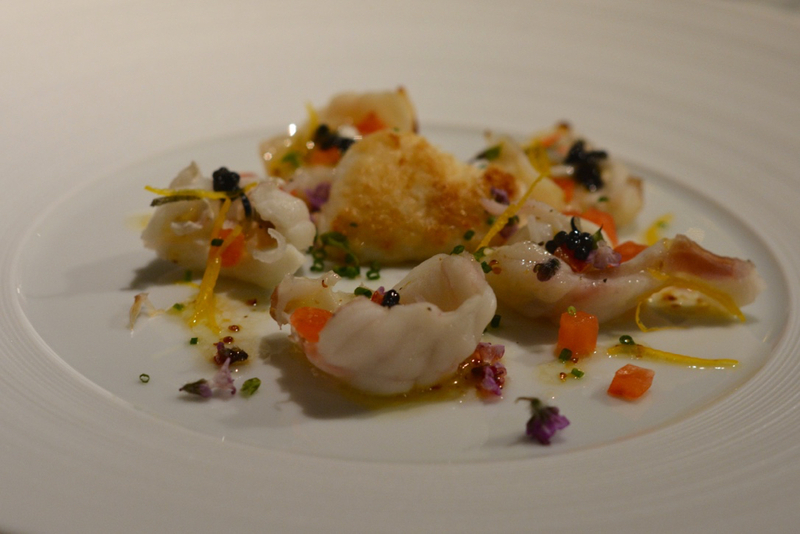 Delicate dishes of seafood, meat, and vegetables were as pretty as they were tasty. The three-hour meal concluded with the chef’s appearance. Much to my surprise, the master of the meal was a woman, which I found a refreshing change from the plethora of male chefs. 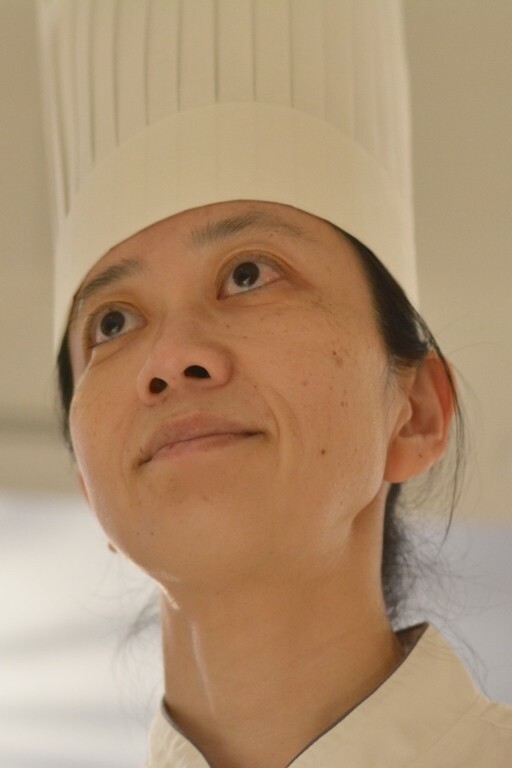 She stood before the table proud, yet humble, as chef Cyril Lignac praised the execution of her menu. Belly full and blurry eyed from jet lag, a non-stop itinerary, and wine, I crawled into a car that drove me the two hours back to Nagoya, the airport I’d at arrived fifty hours earlier. I had four hours of sleep in the same nondescript hotel, before I began my fifteen-hour journey back to Paris. In a few days’ time, my haggard body would recover, but the memories of Japan would remain with me for a lifetime. 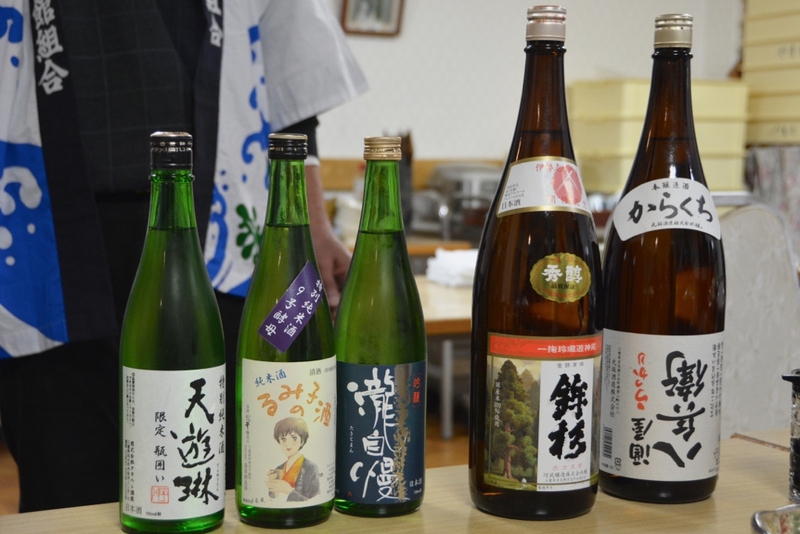 I was a guest of Japan’s Mie Prefecture. In no way was I swayed by the overwhelming Japanese hospitality, the never-ending fountain of green tea, or the freshest seafood I’ve ever tasted. As always, opinions are mine. What an amazing trip! I can only imagine how delicious the food was. Your excursion to visit the Ama divers must have been fascinating. I’m in awe of their hard jobs — despite their ages! Oh, Natalie, this trip was an incredible whirlwind. The Japanese are so kind and the Ama divers left me in awe. I’ll never forget this time in Japan. Yes, I discovered food that I didn’t even know existed. That’s one of the things I love about traveling…learning about the culinary culture of a place. The people at the oyster farms have a tough job, indeed.